"The problem, of course, is that such blows to the head are completely ridiculous. It's not easy to bounce back from a severe concussion, And even if you do, it's unlikely that you'll remember the blow in any kind of detail. ... Plus, it's kind of hard to knock someone out with a single blow." 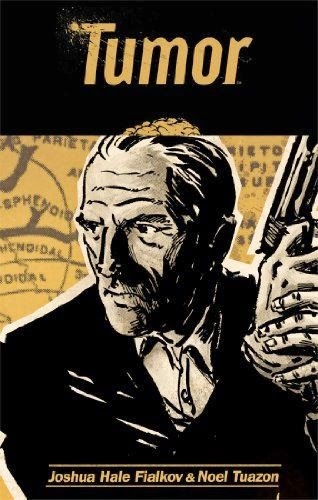 The center of Tumor, by Joshua Hale Fialkov and artist Noel Tuazon, is a broken-down Los Angeles private investigator named Frank Armstrong who must solve one last case before the book's titular malady kills him. The client is a gangster and the case is to find his daughter, and if that all sounds conventionally Chandlerian, keep your eye on the tumor. Armstrong blacks out, his sense of time is compressed, stretched, and fragmented in ways that seem far more convincing a rendering of brain injury or disease than one finds in most crime writing. And, through the book's first three chapters, at least, there is no hint of excessive cleverness, no evidence that Fialkov is doing anything so conventional as straining to defy convention. I'm not sure I could say the same for most comics since, say, 1987. "For me, there was never a nudge, nudge, wink, wink. I wasn't trying to be clever or find a new place from where I could spin on an old tale. As I wrote the book, it seemed to me I was merely stating the obvious. The between-the-wars PIs were so damaged. And they were drunks. There was simply no logical way they could be ingesting all that good Prohibition booze in the quantities stated and still be getting through their cases as calmly as it appeared to happen." The quick recoveries from violence have become so accepted by the public, it gives me pause to wonder if it's among the reason for some violent crime. Not that it encourages people, but that they don't think the consequences will be as severe. "So I hit him on the back of the head and put him out. He'll be fine in a few hours." No, he won't. @Dana King: That is a great point. I actually think that this tendency to minimize the effects of violence is much worse in movies than in books, because in movies the hero always has to LOOK good in the next scene, while in books the protagonist can be out of it and dishevelled for a while and it doesn't affect the flow of reading. Just as prevalent as the blows-to-the-head are the many instances of the hero jumping ridiculous distances, and then landing and running off when in reality both his legs would be broken. But Hollywood will always be Hollywood. My biggest beef with "Mad Men," for example, is that after the years we have seen of Don Draper abusing his body, getting into auto accidents, etc., he wouldn't look much like Jon Hamm on the show, who seems not a bit worse for wear from the first season to the last. Ray, I especially like Tuazon's "mood" panels: drawings that are not directly part of the narrative, but function more like exclamation points or visual highlights markers. Dana, it would be interesting to leap into the Wayback Machine or do some archival research to determine what early hard-boiled writers thought about the quick recoveries and one-punch knockouts and quick recoveries. I suspect that in the eras before the flawed hero, writers could simply not imagine (or readers accept) a hero subject to the same physical maladies as you and I.
Duane's introduction mentions Chandler and Carroll John Daly. I don't remember if Hammett's name comes up, but two scenes from his work come to mind: the Op knocking out the lunger in Red Harvest and Ned Beaumont's beating and imprisonment in The Glass Key. Hammett may have been ahead of the pack in depicting physical violence and its effects just as he was in other area. Patrick, I think you're right about movies. I remember one of the Batman movies, I think the abominable Batman Begins, puts Bruce Wayne through the agony of scaling a Himalayan peak. All I can say is that the trauma of seeing his parents shot must have so traumatized young Bruce that it forever inhibited his ability to grow facial hair. His face is as smooth as a baby's skin when he starts out, and just as smooth when he reaches the top. Patrick, your beef about Don Draper is almost identical to Linda Richards' observations about old-time hard-boiled detectives. Peter, it's been a while since I read RED HARVEST; that scene isn't coming to mind. I well remember Beaumont's situation in THE GLASS KEY, and it's a good example. I'm also reminded of FAREWELL, MY LOVELY, when Marlowe wakes up in hospital/sanitarium. whatever, recovering form a beating and drug overdoes, what it takes for him to stumble to Anne Riordan's house for help. The one false note I thought JUSTIFIED struck at the end was how quickly Boyd Crowder was able to recover from being shot in the shoulder, and damn near blowed up. He should have been far more the worse for wear. Dana, the Red Harvest scene is the one where the Op knock out Dan Rolff (the sick guy), then tells Dinah Brand that he did it so Rolff could salvage some self-respoect, that the Op took him seriously enough to fight him. Previously she had been treating him like a toy and a cripple. That scene earns Hammett points for two reasons: Rolff was physically frail, so it might have been easy to knock him out, and Hammett makes the scene morally realistic, by having the Op explain why he hit Rolff. Thanks, Peter I remember it now from his explanation to Dinah. That was a great scene. Sort of gets you right there, doesn't it? And this from a author whose cool affectlessness is set against Chandlerian romanticism. The Op was a softie with a hard edge. While I agree that movie fights NEVER resemble any of the real fights I've witnessed or been in (in real fights most blows miss for example) I do take issue with knock outs. When I was playing rugby a lot I was knocked unconscious maybe 7 or 8 times - nowadays youd be taken to hospital for observation but back then I sat on the sidelines for about five minutes and went back in the game. I remembered every time I was knocked out, who did it and how I was going to get them back. Its just simply inaccurate to say that you need days or weeks to recover from a concussion or knock out blow. Certainly thats sensible medical advice in 2015 but its not how things were done as late as the 1980s. Adrian, I have likely spent nowhere near as much time unconscious as you have, but I don't think anyone is suggesting that a detective would be incapable of functioning for days or weeks after a concussion. Rather, current thinking seems to be that he or she should keep of his or her feet for that long. Notice the emphasis in Linda RIchards' comment, albeit about booze rather than concussions. Seems to me she does not say a detective could not function while drinking, but rather could not continue to function long if he kept on drinking. In any case, what I find ridiculous about cinematic knockouts is not their intensity, but their ease. I just don't think one punch, especially ones that don't look terribly powerful, could knock a human out in most cases. Keep off his or her feet that long not in order to be able to function at all, bit rather to be able to function fully and without risk, I meant to say. As a fan of both crime fiction and comic books, I need to check this books out. I'm a big fan of the author. Fialkov writes other comics such as The Life After and The Bunker, which are great books. The Life After particularly is a unique story, presented with Fialkov's unique vision and story-telling. While I love great art in a comic book, it's great storytelling that keeps me involved and coming back. Fialkov can tell a story. Thanks, Rob. I had not heard of Fialkov before the clerk at my local comics shop recommended Tumor. That story uses a number of themes familiar fro hard-boiled crime fiction, and revitalizes them. So yes, I'd say Fialkov can tell a story. Although I have never been knocked out, I did trip and hit my head on the sidewalk once, and got a black eye from it. I went on to the party I had been headed to, and someone checked me for concussion, but I still stayed for the gathering. The next day, my head did feel a little the worse for wear, which I wasn't really expecting. After reading everybody's comments, the next thing I read was an Opinionator piece from the New York Times, and it was by an author I hve liked called Brock Clark, and it was called The Cost of Getting Kicked in the Face. It was about the literal cost and again is one of those things people don't think of so much when they write fights in crime fiction. Actually, Ken Bruen might. I suspect Ken Bruen might think about cracking a joke. I also am skeptical that anyone's revenge fantasies involve "Howmuch?" I mean, it seems to much like a New Yorker short story to me.